Casey J. Symonds is one of the founding members of Kelly, Symonds & Reed, LLC. Mr. Symonds' practice is 100% devoted to litigation, and he currently practices in the areas of domestic litigation, state and federal criminal defense, personal injury, worker’s compensation, traffic offenses and general civil litigation. 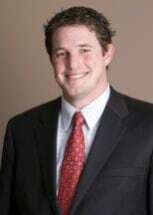 Since graduating from Creighton University School of Law in 2005 Mr. Symonds has gained substantial trial experience, including successful first-chair jury trial experience and numerous bench trials. Prior to Kelly, Symonds & Reed, Mr. Symonds worked for a well-respected insurance defense firm in Kansas City, and he has parlayed his knowledge and understanding of the insurance industry into a successful personal injury practice. Since the formation of Kelly, Symonds and Reed Mr. Symonds has obtained over $750,000.00 in personal injury settlements for his clients. Outside of the practice of law, Mr. Symonds enjoys spending time with his wife, Summer, and their young children, Keller and Lyla.